Chase is dark rusty compact, solid dog with very vivacious character, with the great taste to work. He lives any activity. Training, playing with children, sport, swimming. He is socialized without the bearing defects. For the sake of the fault of time the training lasted from his 11 to his 23 month only when I passed 7 exams of performance with him. He has been taking part in expossitions since he was young. 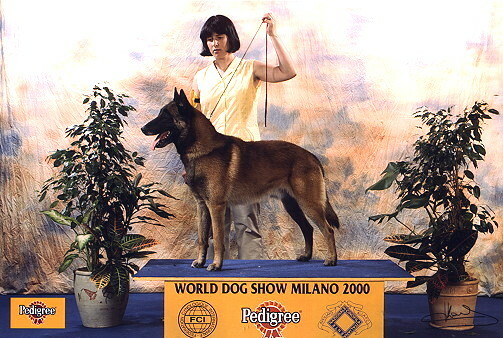 When he was 12 months he won the title Jugendbester on the international exhibition in Tulln (A), excellent 1, BOB. When he was 15 months he won the title Junior champion of the Czech Republic and he fulfiled the conditions for the title club champion. He has been passing his temperamental and outdoor qualities to his offsprings. The least very hopeful puppies are in Denmark in the breeding station Issels, in Austria and in the Czech Republic. The last litter should be in February 2002.